IF you've decided your honeymoon in 2015 is going to be in Europe, think about going a step further with the ultimate in honeymoon ideas… adding a romantic sailing in the Mediterranean aboard either of the boutique mega motor-cruisers SeaDream I or SeaDream II that are rated #2 and #3 of the world's Top 3 Boutique vessels*. SeaDream's Honeymooners' package is complimentary and includes a private dinner one night on deck with your own personal wait staff and a guitarist's visit for a special serenade, dinner with the captain another night, your bed strewn with rose petals and with centre-piece towels shaped like swans another, and on yet another night sleeping on deck under the stars on a rose petal strewn SeaDream Balinese Dreambed. You'll also enjoy chocolate-coated strawberries at turndown one evening, a special "Lovers Surprise" dessert at one night's dinner, and an alfresco breakfast for two in a secluded deck location one morning. 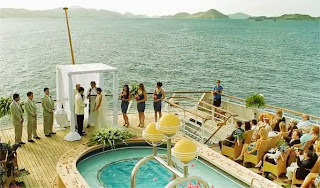 SeaDream Yacht Club, whose 112-guest SeaDream I and II will sail in the Mediterranean from May to October 2015 (and then in the Caribbean to April 2016,) also has a special program that enables honeymooners to sail free. 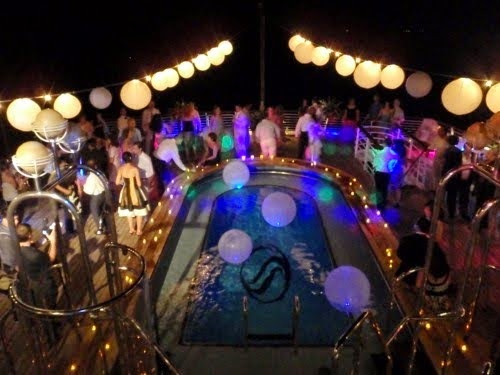 For instance book six staterooms for family or friends to sail with you for 6-nights from Piraeus (Athens) to Civitavecchia (Rome) on October 17 2015 from US$4266pp twin share, and you'll get a seventh honeymoon stateroom for yourselves for free. SeaDream's prices are inclusive of award-winning cuisine, premium lunch and dinner wines, bar drinks, power and sail water-sports, and onboard gratuities. *#1 was Hanseatic, whose predominantly onboard language is German. 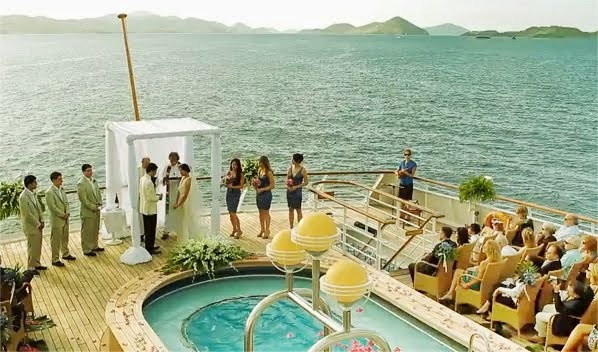 THIS couple got married on SeaDream and then stayed aboard for their honeymoon with 100 guests through the Caribbean. 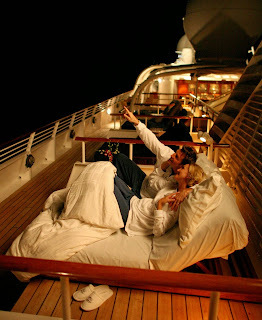 PARTYING into the night after their onboard wedding. 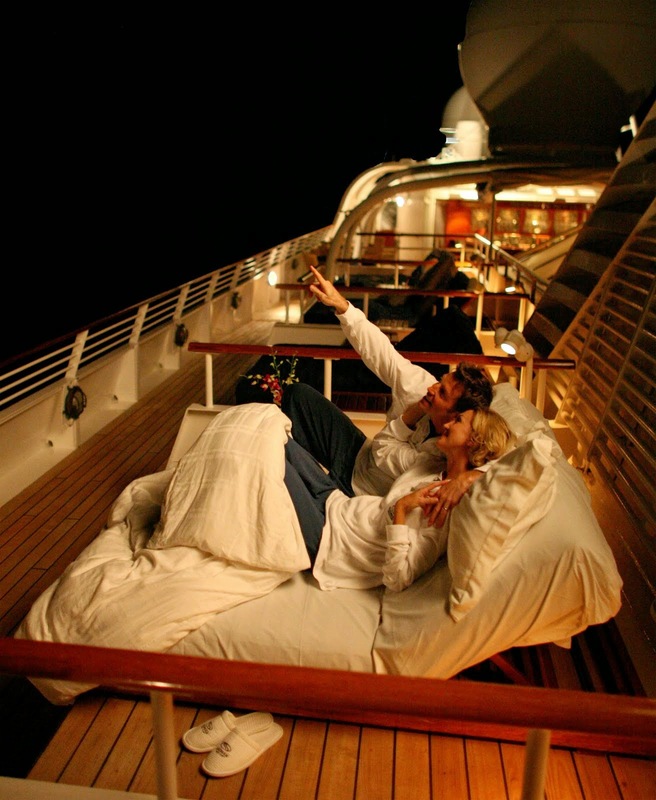 COMPLIMENTARY Honeymooners' package on SeaDream includes a night on deck under the stars on a DreamBed strewn with roses. "EVERY newly-wed deserves a Honeymoon on SeaDream" – Californian Honeymooners' note to SeaDream Yacht Club on their return home.